The newest darling in the world of baking -- the classic French pastry has been embraced by a whole new generation of bakers. Making this classic at home is much easier than you think. 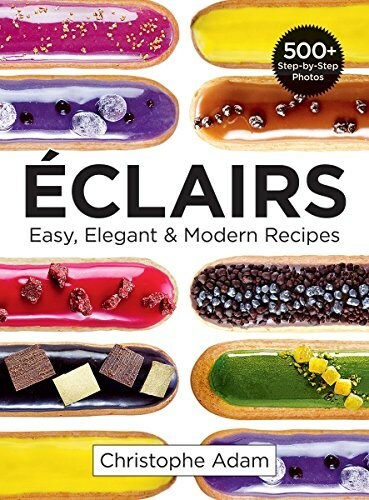 And it's made easy by the fact that it's written by one of Europe's top pastry chefs, Christophe Adam. With its straightforward approach, full color pages and hundreds of step-by-step photos, it's as though Christophe were by your side giving you a lesson in your home kitchen. Over the last dozen years, Christophe has perfected the éclair and has turned it into a gourmet delight which marries unconventional and imaginative fruits, flavors, colors and textures, resulting in luxe éclairs that will have you reaching for seconds and thirds. Christophe has created 25 innovative recipes (both introductory and advanced) that will be perfect for everything from casual gatherings with family and friends, to formal celebrations. With these easy-to-follow instructions and some practice with the basic techniques you'll soon be mastering these recipes as well as inventing new ones of your own. Some of Christophe's creations include Chocolate Popping Sugar Éclairs, Hazelnut Praline, Caramel-Peanut, Lemon, Cherry-Raspberry Sugared Almond Éclairs, Fig Éclairs, Pistachio-Orange Éclairs, Vanilla Éclairs, Raspberry-Passion Fruit Éclairs and Hazelnut Mix Éclairs. A complete list of utensils, a few simple rules and invaluable tips and techniques are sprinkled throughout and will be hugely appealing to novice and experienced bakers.